If you’re responsible and clever with your credit card, it can be wonderful to just haul it out and use it wherever you are. By using it wisely you can build up your credit and even use it for emergencies like when you need to repair your car. Think about getting the gold credit card African Bank offers. As a registered credit provider, African Bank provides these credit cards. The new African Bank opened in April 2016 after restructuring, and apart from applying for a credit card with them you can also borrow, insure and save. The bank provides flexible credit card solutions with competitive interest rates as well as convenient repayment terms. African Bank tells you to compare their different credit cards so you get the one that is affordable to you. They have a review site of their cards so that you can choose with confidence. Their most basic card is the Blue Classic card while the Gold and Silver credit cards give you additional benefits. The colour Gold for instance, speaks volumes, and with this card, and with it you will make the right impression. When you buy something, you’ll notice no transaction fees. The first four ATM withdrawals are free of charge too. For starters, African Bank’s credit cards are easy to apply for and they meet your financial needs, what with their easy repayment plans. To have this shiny gold plastic in your wallet, you need to be 18 years of age or older. If you’re wondering about whether your credit will allow you this card, don’t worry – just complete the online form they provide. 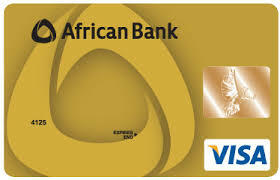 The African Bank Gold Credit Card comes with good approval rates as well as fair interest rates. You can us e the card anywhere in the world . The monthly fee for the card is R68.40 and there is also a once-off activation fee. Look after your card because if you lose it there will be a replacement fee of R114. The card’s Purchase protection guarantee covers you with their complimentary purchase protection. Credit Life Insurance – for those unexpected insurable events, you get Credit Life Insurance where pensioners are covered for death. Non-pensioners will be covered for death, retrenchment, temporary disability, permanent disability, compulsory unpaid leave and more. With this gold credit card of yours, you’ll be able manage your accounts and view your account balances, look at statements, stop a lost or stolen credit card, log an insurance claim and more. With all these offerings and more, you can see why, when you take out your African Bank Gold Credit Card, people look at you in envy, because they know that this card is making your life a whole lot easier.